Last December, Metro Atlanta held an open house to celebrate its relocation into a new state-of-the-art development center located in College Park, Ga. The new facility will not only enable Metro to build upon existing community partnerships, but it will also expand its community reach by providing direct services to mentors and mentees, other program participants, as well as community partners and stakeholders. The area of College Park offers Metro a unique opportunity to reach an area where there are minimal social service providers in the region. It’s also in an area known for its higher rate of crime and violence than other cities, which also translates to greater need. Working in unison with the Georgia Department of Juvenile Justice, Metro is now poised to spearhead a statewide effort to implement a comprehensive mentoring system within each of the state’s juvenile justice centers. Metro’s goal is to greatly enhance the potential of the area’s youth and their families to achieve self-sufficiency. Metro launched its first official Atlanta-based offices in 2015 in the Clairemont area of Decatur, Ga. Since then, the faith based non-profit has made its mark by providing much needed community intervention throughout the greater Atlanta Metropolitan Area. 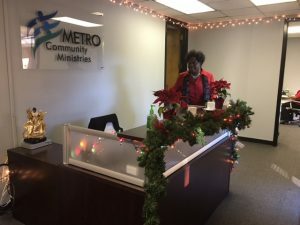 The implementation of Metro’s signature program, Neighborhood College and the I Choose Me mentoring program has elevated the Atlanta office to be viewed as experts in community development and organizational capacity building among government, local non profits, and faith based organizations. Metro’s main headquarters is located in San Diego, Ca., where it has served the poor and disadvantaged for 50 years.